Yesterday as cowardly companies buckled to the bullying and threats of the LEFT and cut ties with the NRA, FEDEX did just the opposite. FEDEX stated that they were not cutting ties with the NRA. A question to the radical LEFT, Democrats and some of these misguided kids from Florida … exactly what did the NRA do? Do you really have any clue what the NRA stands for and what they do? Did they even bother to teach you about the U.S. Constitution and the Bill of Rights? Obviously not. Sorry if I don’t take the advice of a teenager when it comes to a multi-billion dollar business. The LEFT and the likes of David Hogg can rant all they want and attack businesses and attempt to extort them in the wake of the Parlkand shooting. However, you are not really helping, you appear to be just exploiting the tragedy. A note to the companies that buckled to the the pressure from the LEFT and their knee-jerk reactions to cut ties with the NRA, wait for the backlash. Newsflash, there are many more people who own guns and defend the Second Amendment than are members of the NRA. A whole lot more. UPS & FEDEX Draw Fire From Customers After Packages Fail to be Delivered by Christmas … Wonder If Americans & the MSM Will Do the Same with Obamacare? NBC News referred to FEDEX and UPS as “The Grinch” … I wonder if they will do the same with Barack Obama as millions of Americans will not have insurance coverage on January 1, 2014? UPS and FEDEX are certainly to blame for not properly forecasting the volume of delivery packages that they would have to deliver this holiday season. On-line shopping is becoming more and more the way to go as many individuals no longer want to deal with the insanity of malls and simply want to point and click. Also, with the continues recession and bad economy for the common folk, many were forced to ship gifts rather than travel to grandma’s house. Of course this is a PITA, especially if one purchased way ahead of time and thought they had a guarantee that the packages would be delivered to their destination on time. Trying to tell a child that Santa had a backlog of presents just does not quite cut it. Even Cindy Loo Who didn’t really buy the light out on the Christmas tree lie when the Grinch said, “there is a light on the tree that would not light on one side and he was bringing it back to his workshop.” However, that being said … it is not the end of the world. What is a little more important and affects your lives in a much worse way is having your insurance canceled or prices driven up because of Obamacare and not knowing even if you have signed up and enrolled, you have no idea whether you even have coverage. No one forced you to use FEDEX or UPS and if not, pay a tax. The same could not be said for Obamacare. Although many people are giving UPS and FEDEX a piece of their mind on Twitter and Social media and it is much worse than STINK, STANK, STUNK!!! An unexpected surge of online orders in the past few weeks appears to have strained the limits of delivery and fulfillment infrastructure at retailers and parcel carriers. While instances of bad weather, Web glitches and late deliveries from manufacturers also played a part, the sheer volume may have been the problem, according to retail analysts. United Parcel Service Inc. determined late Tuesday that it wouldn’t be able to get some goods to customers in time for Christmas, as a spike in last-minute shopping demand overwhelmed its system. “The volume of air packages in the UPS system did exceed capacity as demand was much greater than our forecast,” spokeswoman Susan Rosenberg said in response to questions. UPS delivers around 45% of U.S. packages and saw more shipments enter its air network on Monday than the 7.75 million it expected. Thousands of Americans awoke to find that special something missing from beneath the Christmas tree Wednesday, a day after UPS acknowledged getting swamped by the seasonal cheer and failing to deliver orders in time. Now, rival FedEx appears to share the blame for the holiday that wasn’t. 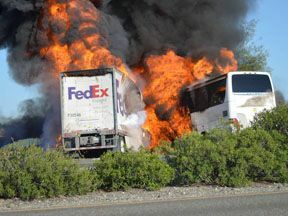 “We’re sorry that there could be delays and we’re contacting affected customers who have shipments available for pickup,” Scott Fiedler, a spokesman for FedEx, told the Associated Press Wednesday. Pressed Christmas afternoon, a supervisor at 1-800-GoFedex, the customer support line, went further in a call with NBC News. He declined to give his last name, citing company policy, but acknowledged “extraordinary” delays at the shipping giant and said his team had been apologizing to customers. “We give our apologies to customers,” he told NBC News, noting that bad weather had crippled planes and delivery trucks and unforeseen demand swamped what vehicles remained in operation. That mirrors what UPS first acknowledged on Tuesday, as the complaints piled up and packages failed to arrive.